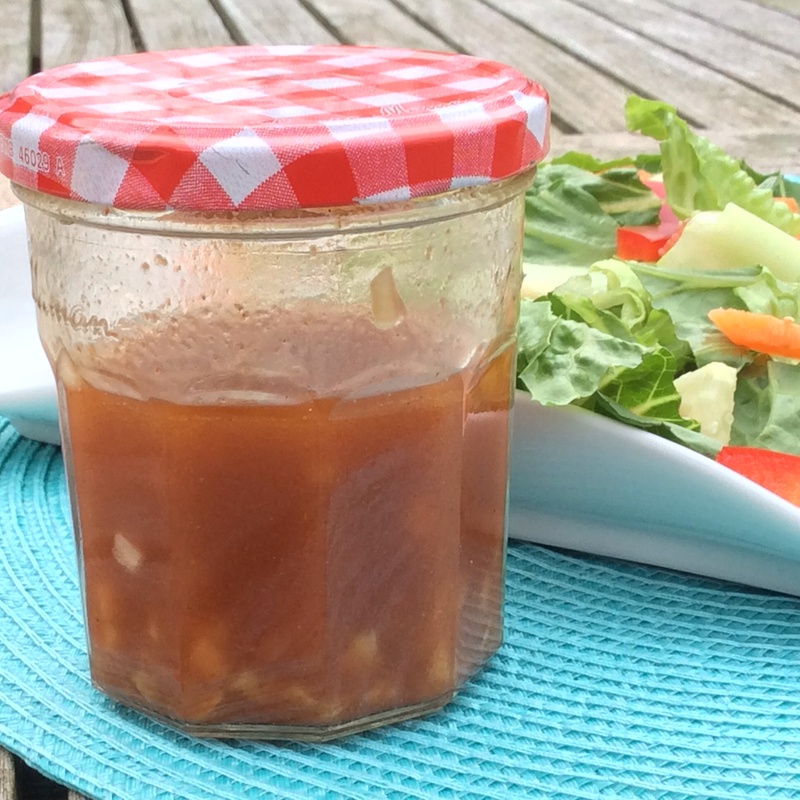 French dressing— have you had it recently? Until a few weeks ago, I hadn’t. I hadn’t made it, seen it on menus, or been offered it at a friend’s home for many years. But back in the 19… well, lets just say a while back, French Dressing was more popular than it is today. It seemed like a common choice. I am not sure how it fell out of favor, but a few weeks ago while flipping through my binder of recipes, I came across a recipe for Old Fashioned French Dressing that my Dad had passed on to me (thanks, Dad). I resurrected it and have been enjoying it on salads since then. This dressing has fresh flavors and a little bit of kick. It is a creamy vinaigrette that gets its red color from chili sauce (hot pepper sauce works wells, too). I am not sure of this recipe’s origins, but I do know it is a nice change of pace from my usual balsamic or red wine vinaigrette. 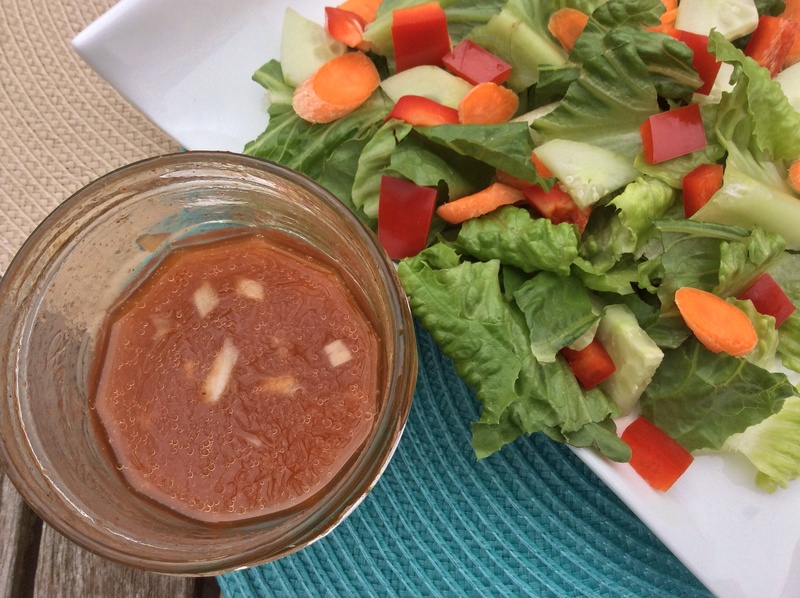 I’ve enjoyed this French dressing with Boston Bib and Romaine lettuce as well as with my version of a chef salad (lettuce mixed with cheese, hard-boiled egg, chicken and/or beans and veggies). My recipe says “serve with artichokes, green salads, citrus salads, or even cold meats.” I’d add asparagus to that list. It is a versatile dressing for sure and one I hope you try. Lettuce season is almost here in the Northeast and I know this will be one of my go-to dressings for the coming months. I think it’s time French Dressing made a comeback. Use less chili sauce if you prefer a milder dressing. 1. Combine all the ingredients in a jar, put the lid on and shake to mix. 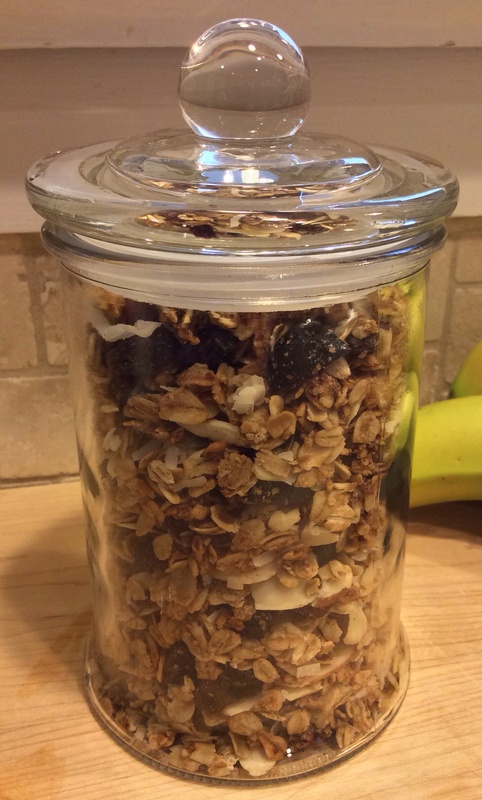 Yes, this is another granola recipe. And maybe you already have a recipe you like, but this one is worth a try. It is my family’s favorite cold cereal. It is crunchy, spiced and just sweet enough to satisfy all the picky eaters in my home. 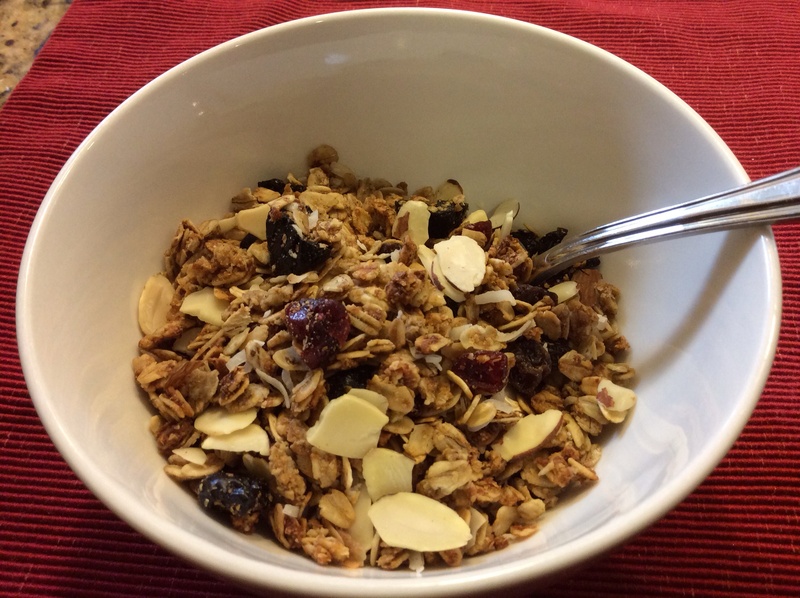 And, really, granola makes such a good breakfast that it won’t hurt to make a batch. Plus, it is so much heartier than boxed cereals that I don’t feel guilty about not cooking breakfast when I tell my kids to hurry up and grab a bowl of granola. We typically just pour some milk over our granola but it is also perfect sprinkled over yogurt. I like it so much I even find myself snacking on it when mid-afternoon or late-night hunger overtakes me (I’m enjoying some as I write). My only caution is that it is easy to eat with your eyes. Many times my kids have filled a bowl with granola and then dumped half of it in the garbage because they were too full. I hate to see good food go to waste. Plus, in the back of my mind, I am calculating how many breakfasts and snacks were just wasted and how much sooner I’ll need to make more granola. Ridiculous but true, so don’t go there; scoop lightly. When I make granola, I get out my largest bowl and I triple the recipe. I prefer to stash a large batch on top of my fridge than to make a new one every week. Not that it takes that long to make; it doesn’t. Maybe a half-hour hands on time and then about 40 minutes in the oven. But if I can save myself an hour or so a week, I’ll triple the recipe. Once I have my largest bowl out, I mix up the dry ingredients and make a well in the center. 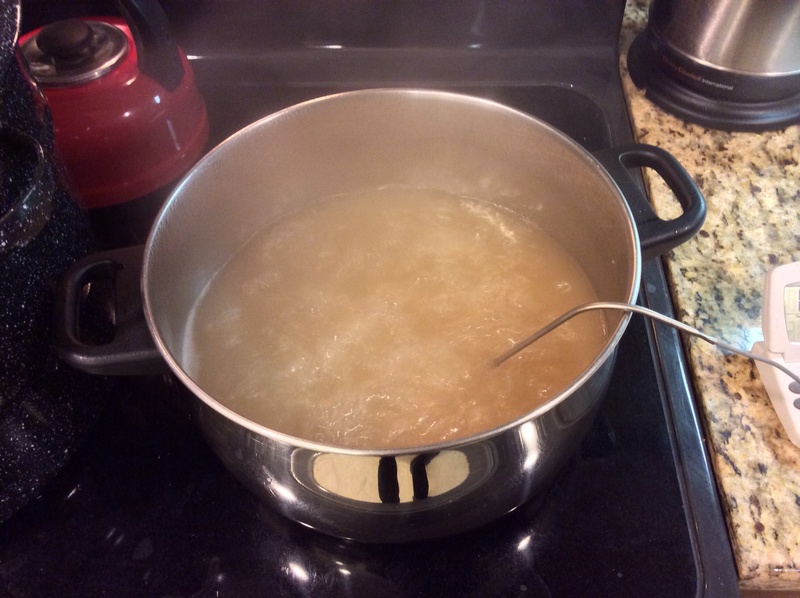 I pour the wet ingredients into the well and then stir until well-combined. Next I coat my sheetpans with cooking spray and spread the granola out on them. One recipe makes 1 half sheetpan (12″ x 17″) . Then I bake the granola, pulling out the sheetpans about every 10 minutes. 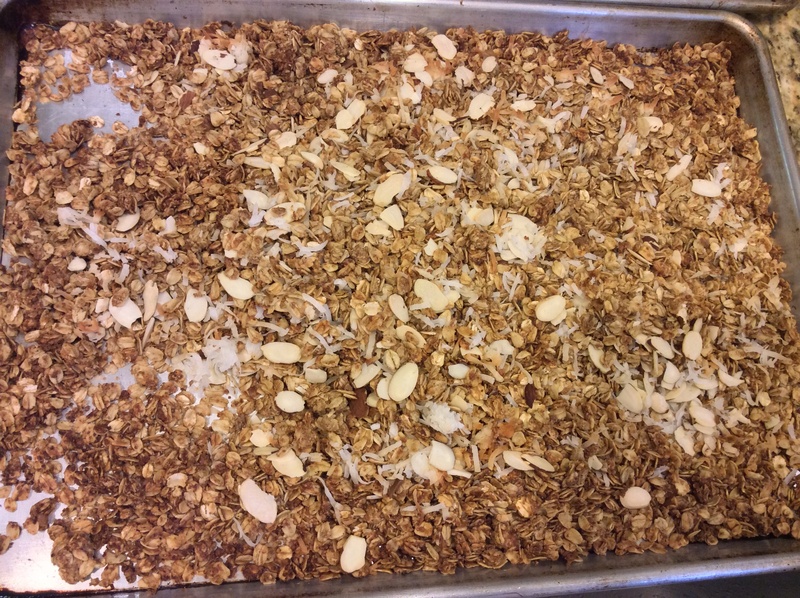 The edges will be browning so mix up the granola to ensure more even browning. 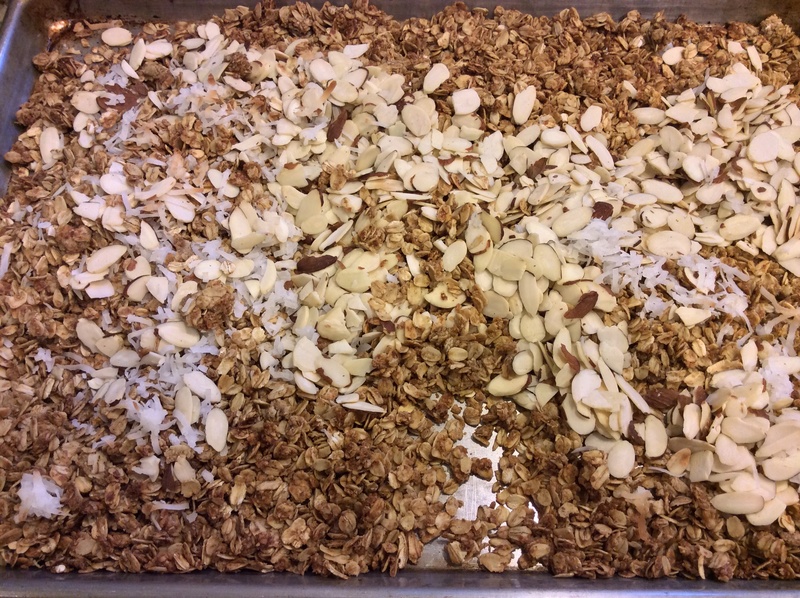 About 30 minutes into the baking, I add my coconut flakes and sliced almonds to the sheetpans. They brown a lot faster than the granola and so need less oven time. 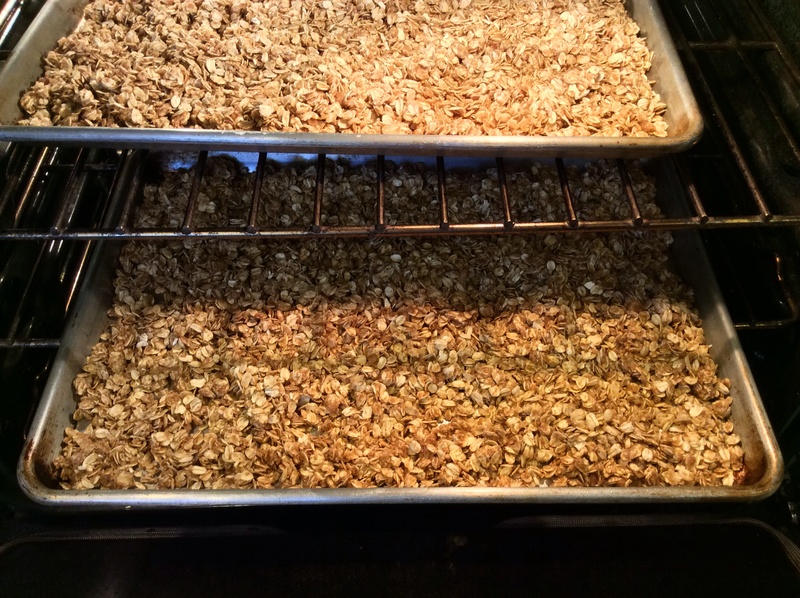 Continue baking for about another 10 minutes, until the granola is just lightly browned. You do have to watch it. I got distracted once. My nose finally called me back to the oven and I had dark brown (burned) granola and it was not good. No one ate it. 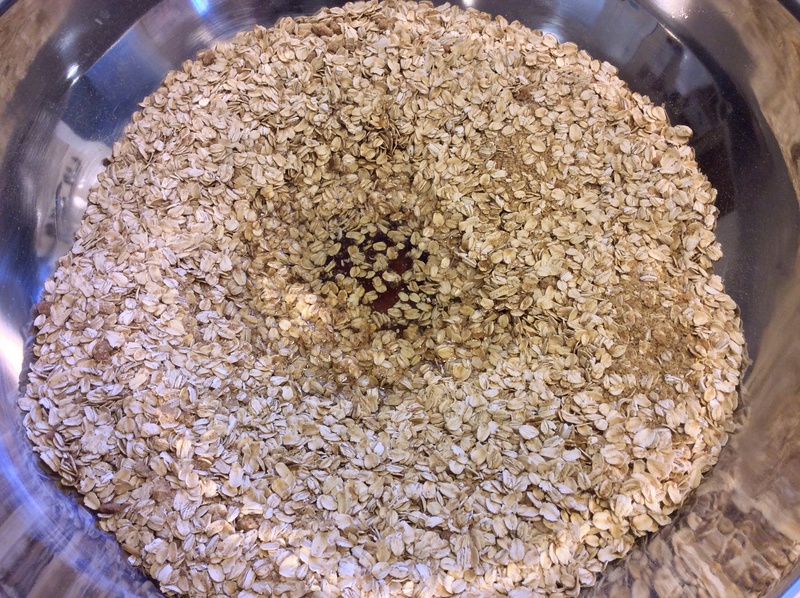 After the granola is baked, I pour it back into the same mixing bowl (don’t even bother washing it). I add my dried fruit— whatever I happen to have in the cupboards, typically raisins, cranberries and cherries— and toss to combine. Then I grab a small bowl and do a taste-test. 1. Preheat oven to 300°F. Combine first seven ingredients in a large bowl. Make a well in the dry ingredients and pour in the water, oil and honey/maple syrup. Stir to combine. 2. Spread out on a greased sheetpan and bake for 30 minutes, pulling out the sheetpan every 10 minutes to stir the granola. After 30 minutes, add the almonds and coconut flakes. 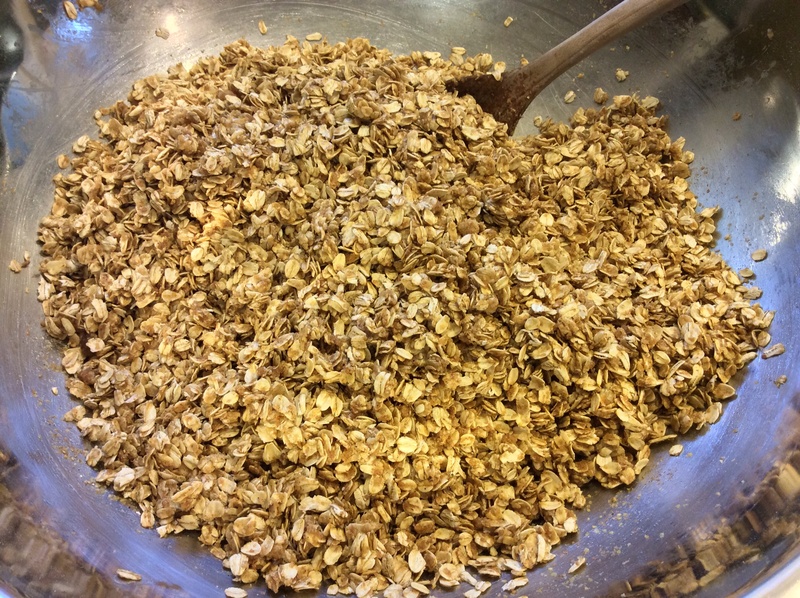 Continue baking until granola is lightly browned, about another 10 minutes. 3. 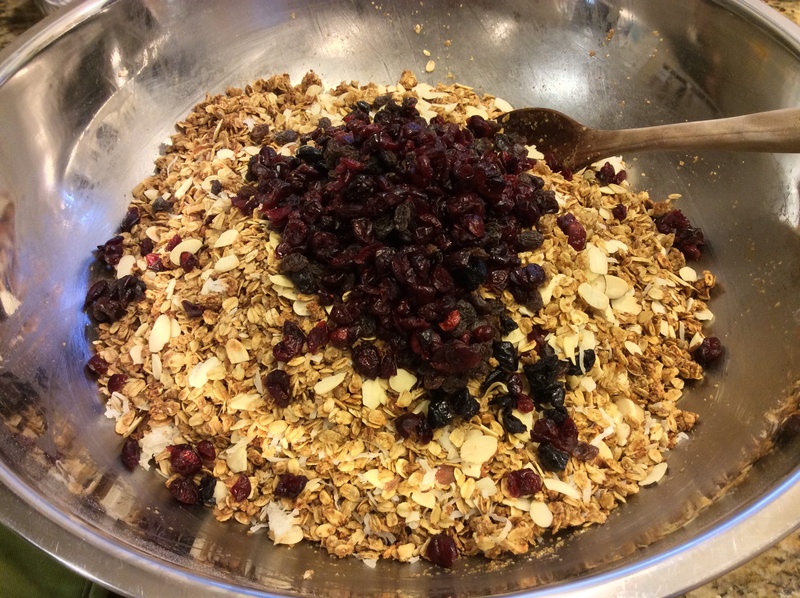 Pour granola back into large mixing bowl. Add dried fruit and stir to combine. Cool and then store in an airtight container. 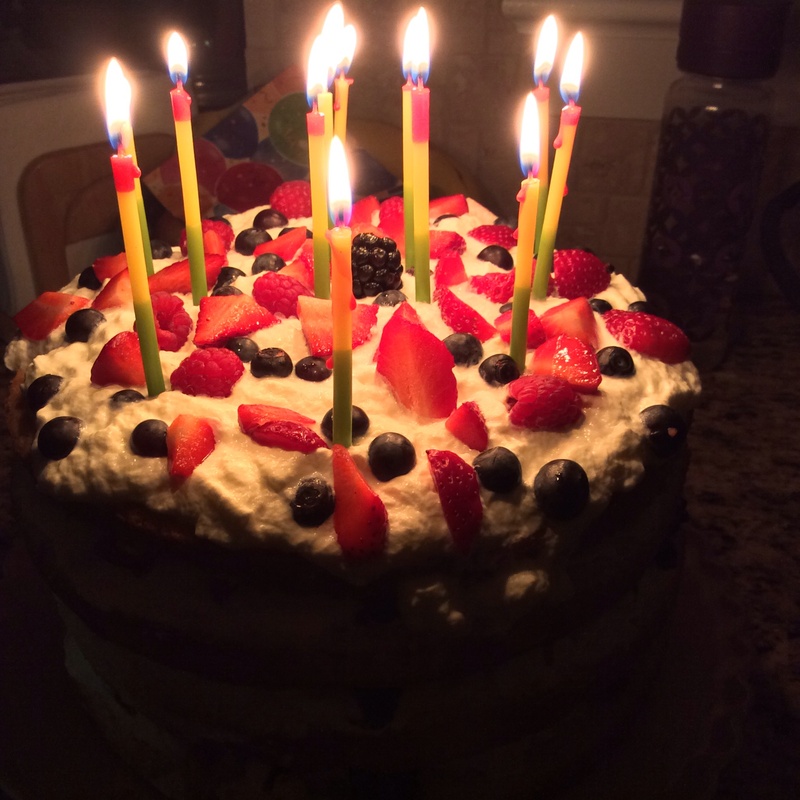 It has been a busy week around my house— birthdays always do that here. We tend to make a big deal out of them. (Note to new parents: don’t start any traditions that you don’t want to carry on for many years to come.) It starts the night before the birthday when we sneak into the birthday child’s bedroom to fill it with balloons and to string streamers across the doorway. 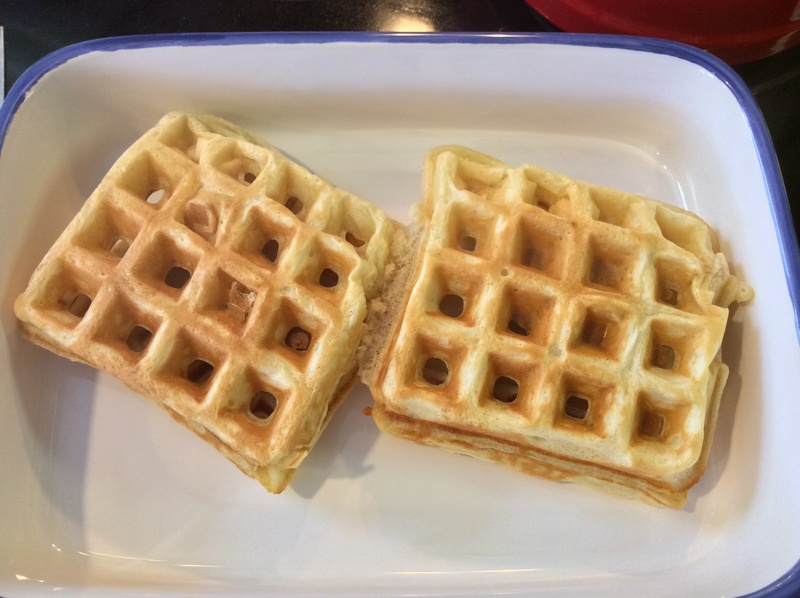 Then in the morning, we wake the child by singing Happy Birthday, and if she is lucky enough that her birthday falls on a weekend, we carry in a tray with the requested birthday breakfast. If it’s a school day, we hold off on breakfast-in-bed until the weekend. Of course there are cupcakes for school and definitely cake for dessert at our house. Over the years our children have also gotten in the habit of choosing their favorite meal for dinner (chicken pot pie with a layer of mashed potatoes under the crust was this year’s request). All in all, this ends up being a lot of work for me. Good thing I really like my kids! But the good news is that the easiest thing I did for my daughter’s birthday was the most spectacular looking— her cake. It was a simple two layer vanilla butter cake, each layer cut in half. 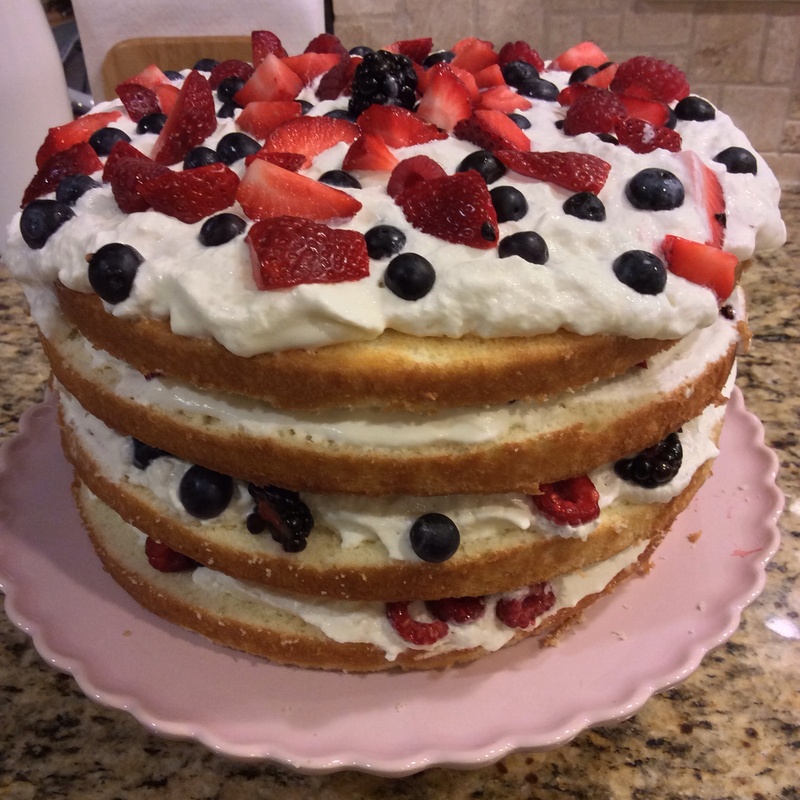 I stacked them with sweetened whipped cream and berries, as requested. No fussing over frosting a cake and working out elaborate decorations. The berries are both decorative and delicious. This idea is endlessly versatile too. Flavor the cake, flavor the whipped cream, change up the berries used. You can have a different cake every time you make it. In this case, the simplicity of it really is good. 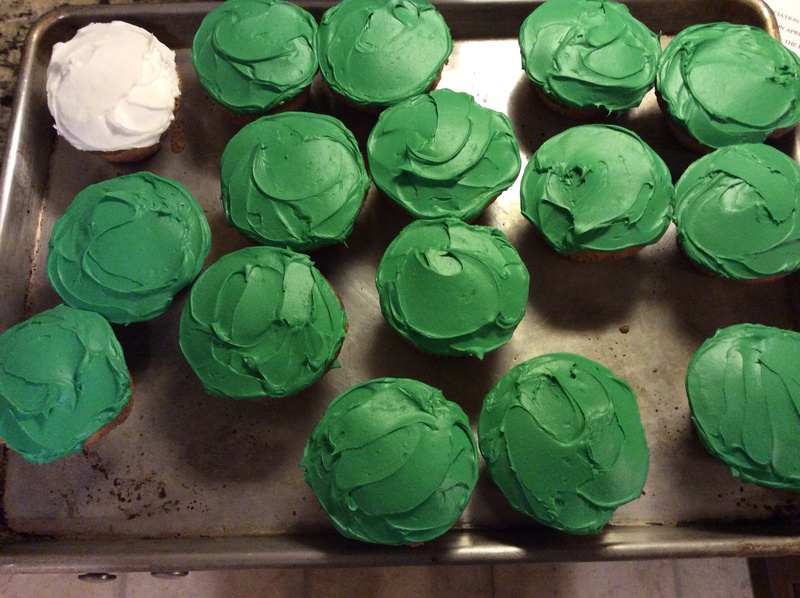 The cupcakes for school required a little more effort but they were fun to do. I doubled my cake recipe to make both the 9″ cake and 24 cupcakes. My now 11-year-old did most of the decorating herself. They are here just for inspiration in case you are looking for a fun cupcake to make. 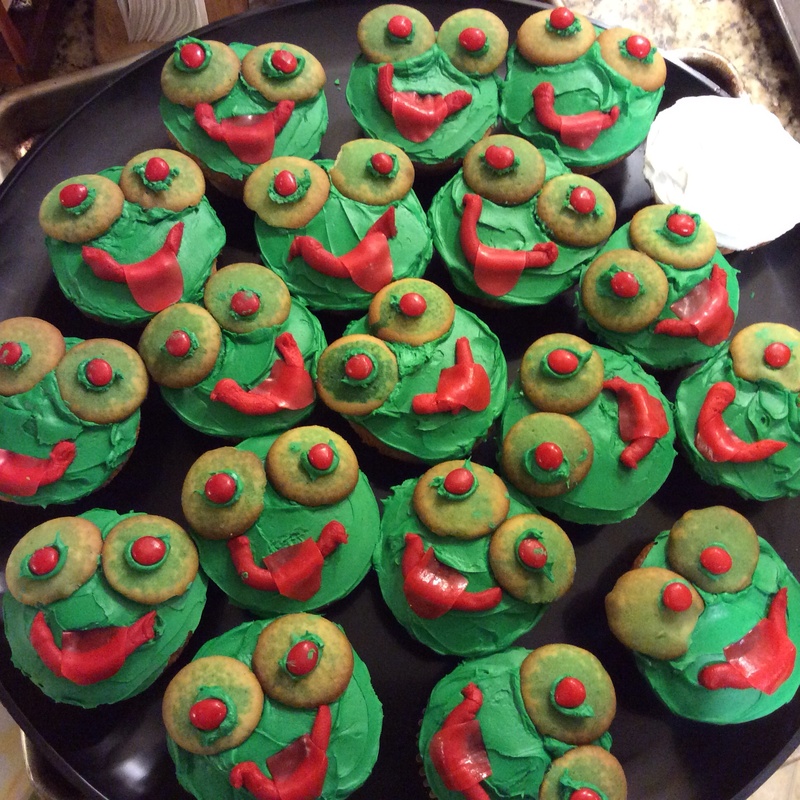 We used vanilla wafers cookies (regular size) for the big frog eyes and very briefly dipped them in a mixture of green food coloring and water. Red hots for the eye centers and fruit leather cut into tongues. The rest was frosting. Easy! I created this cake recipe for Fine Cooking magazine many years ago and have been using it consistently since then. It is light enough to easily cut through (good for the cake above) and yet dense enough to work with a sturdier frosting like buttercream. 1. 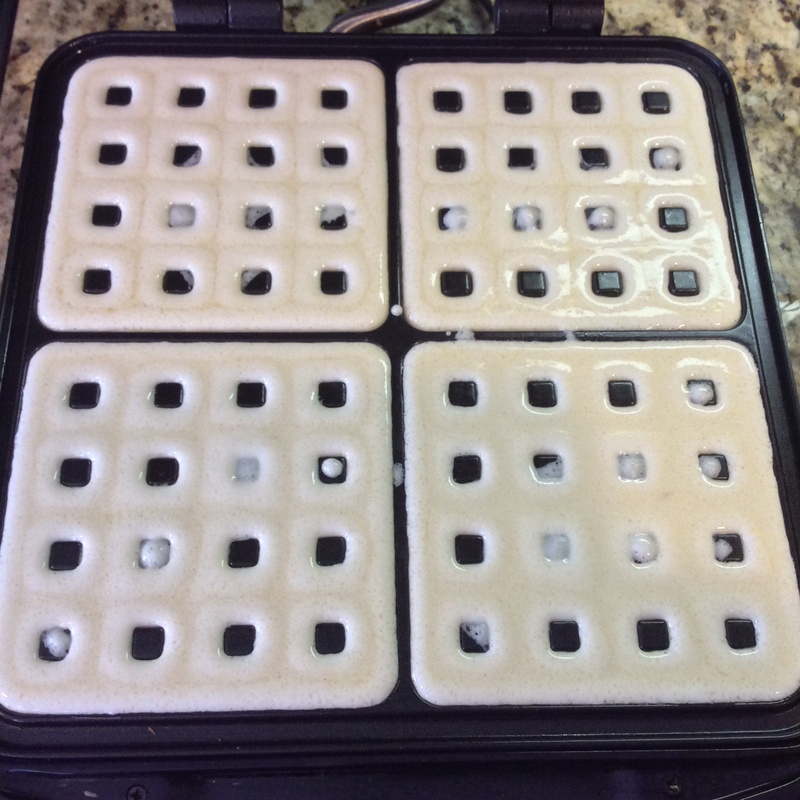 Coat cake pans with nonstick cooking spray and line bottoms with parchment paper. Preheat oven to 350°F. 2. Sift the cake flour, sugar, baking powder and salt into the bowl of a stand mixer fitted with the paddle attachment. Mix on low speed to combine ingredients. 3. Add the butter pieces and mix on low speed for 30 seconds to break butter into small lumps. Add the milk and vanilla extract. Mix on medium speed to thoroughly blend the ingredients, about 1 minute. Add the eggs, one at a time, mixing briefly on medium speed after each addition. 4. Divide the batter equally between the pans and spread it evenly in each pan. Bake until golden brown and tester inserted in center comes out clean, about 30 minutes. 5. Let cool in the pans for about 30 minutes. Run a knife around the edge of each cake and then invert onto a rack. Peel off parchment paper and let cool completely. That’s right, maple syrup and cake have been new and noteworthy in my kitchen in the last couple of weeks. Not together, although a maple syrup frosting would be delicious on an apple or an apple-spice cake. Hmm. Also, it is wonderful on top of oatmeal (and pancakes of course) and I bet it’d be good drizzled over vanilla ice cream. And my daughter wants me to make maple syrup cookies. My brain is very busy coming up with ways to use the first batch of the amazingly tasty homemade maple syrup that my husband and family made last week. 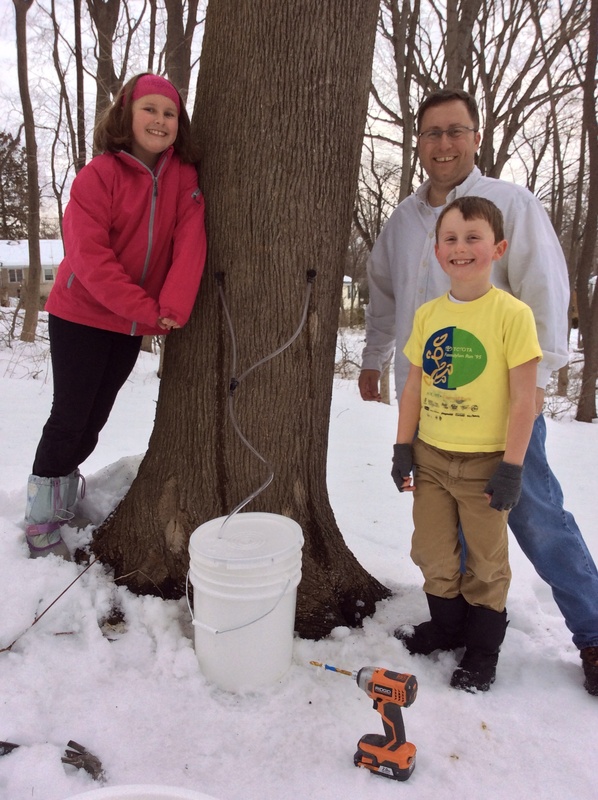 Though the weather turned frosty again this week, we did have about a week of above freezing temperatures and for the first time, we tapped our maple trees. 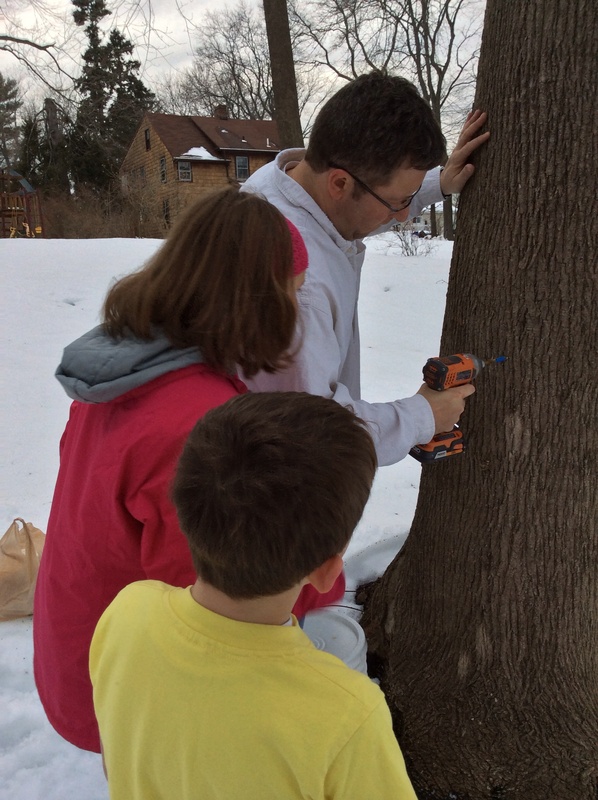 We have lived in our ordinary suburban neighborhood for over a decade and never tried making maple syrup. My husband, Lou, decided this was the year. On our modest plot of land, we have a lot of sugar and norway maple trees. I love these trees. They provide shade all summer (don’t even need to slather sunblock on my kids), vibrant colors and giant leaf piles in the fall, and now, as winter turns to spring, they provide the makings of maple syrup. 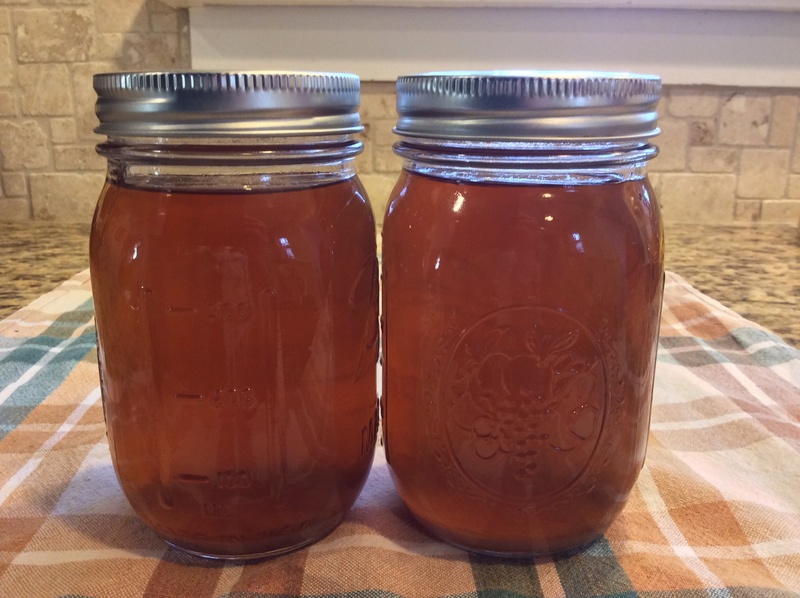 Here is a quick photo journal of our first run of sap. 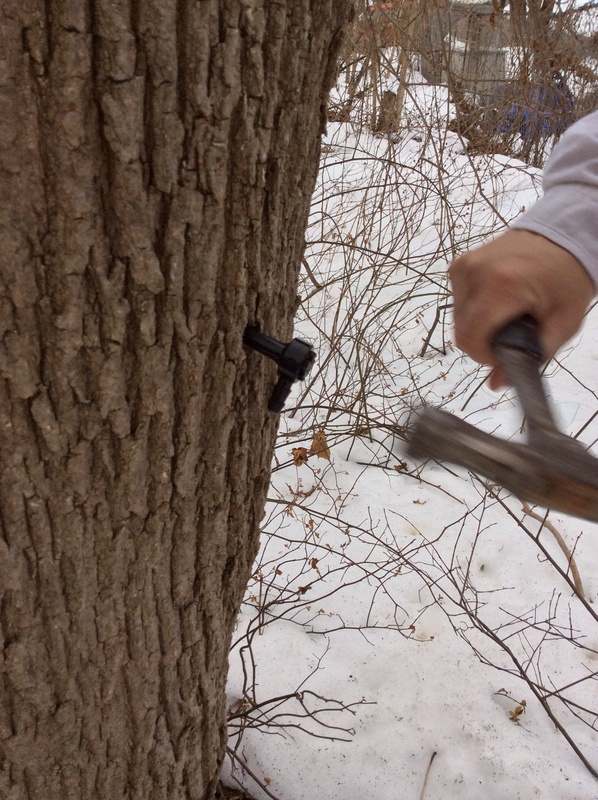 Drilling a hole into the maple. 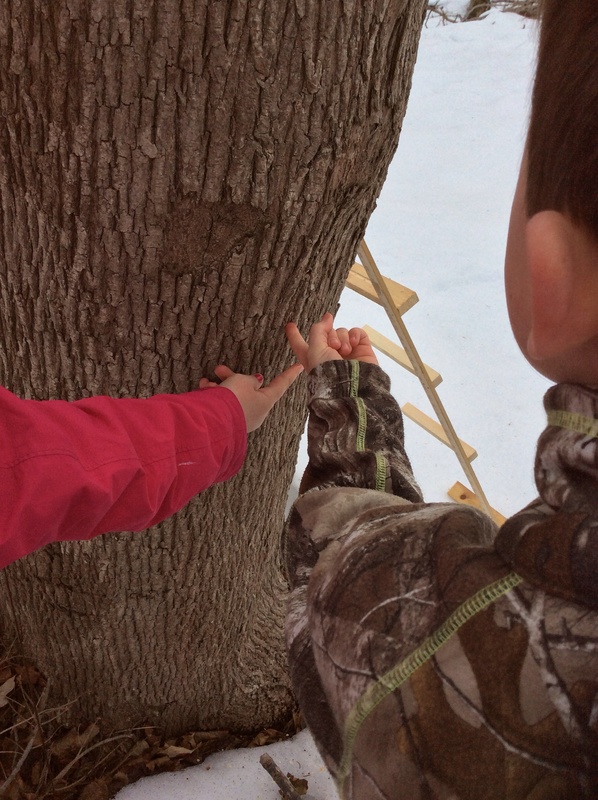 Getting the first taste of sap. Yes it is slightly sweet. Hammering a tap into the hole. Running lines into a collection bucket. Ready and waiting for the sap to flow. 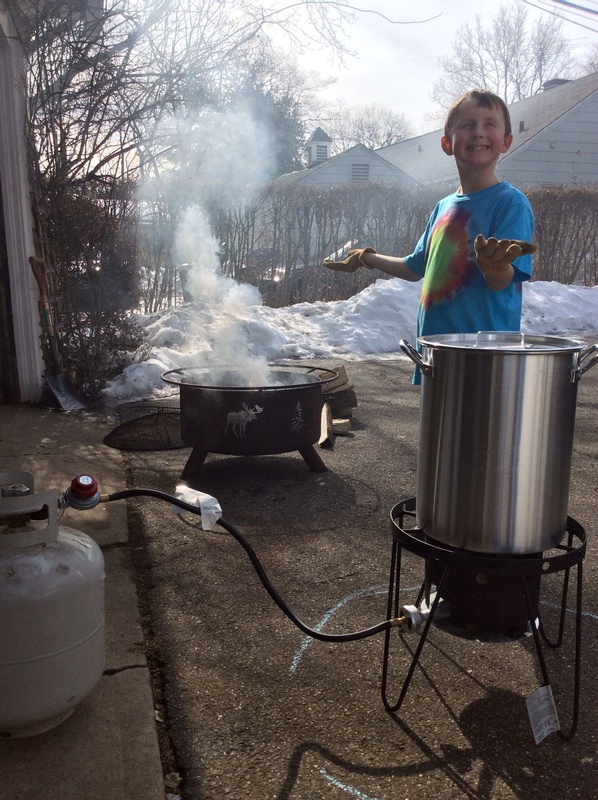 First boil using our fire pit and a turkey fryer. It took all day and into the night. As we get closer to syrup the boiling moves inside. The next morning, pancakes were flipped and syrup was doled out. YUM! 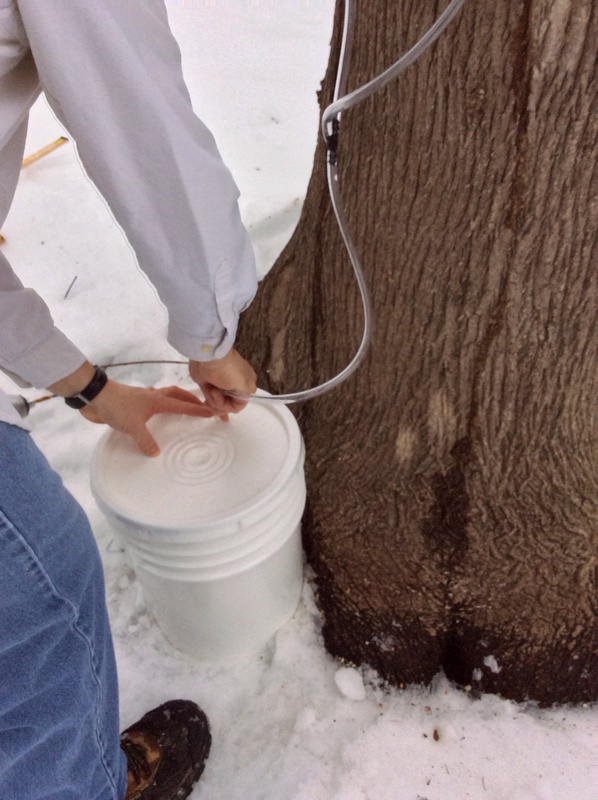 I understand the weather will again warm up some time in March and we hope to get more sap and more syrup. I want to treat it more like an ingredient and less like gold. 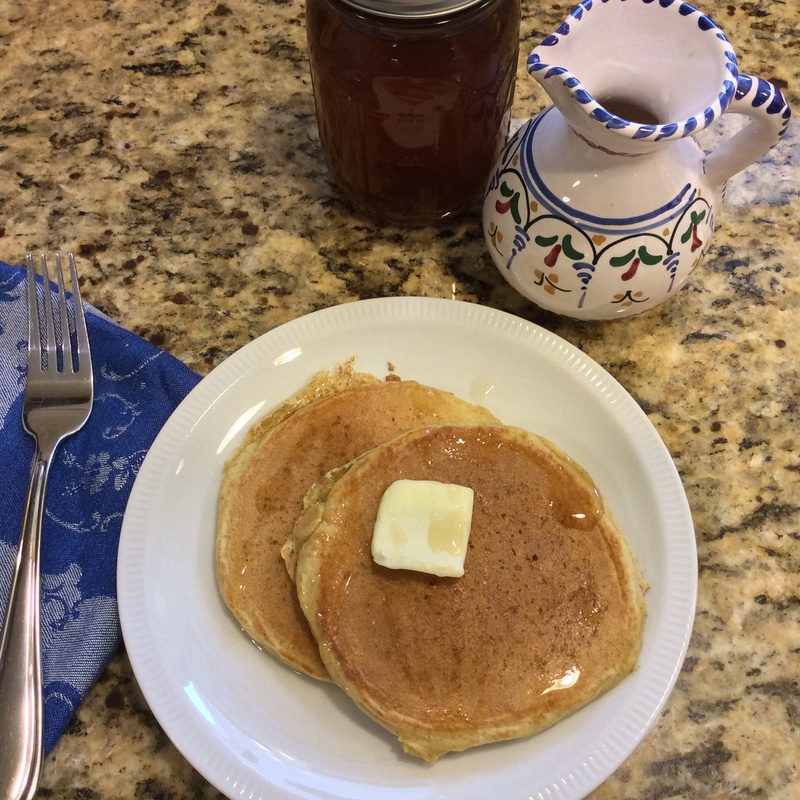 More to come on maple syrup recipes…. 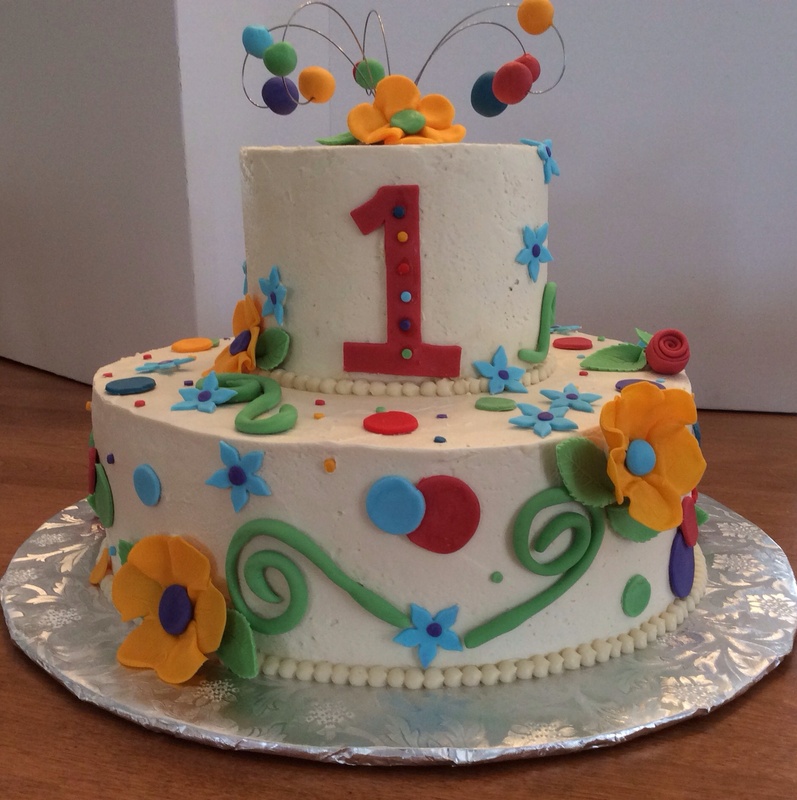 Last week I also made a first birthday cake for a family celebrating in a big way. I love to make cakes for people. I want everyone to know that a cake really can be delicious and beautiful at the same time. Sadly, that has not been my experience when partaking in many store bought and even bakery bought cakes. 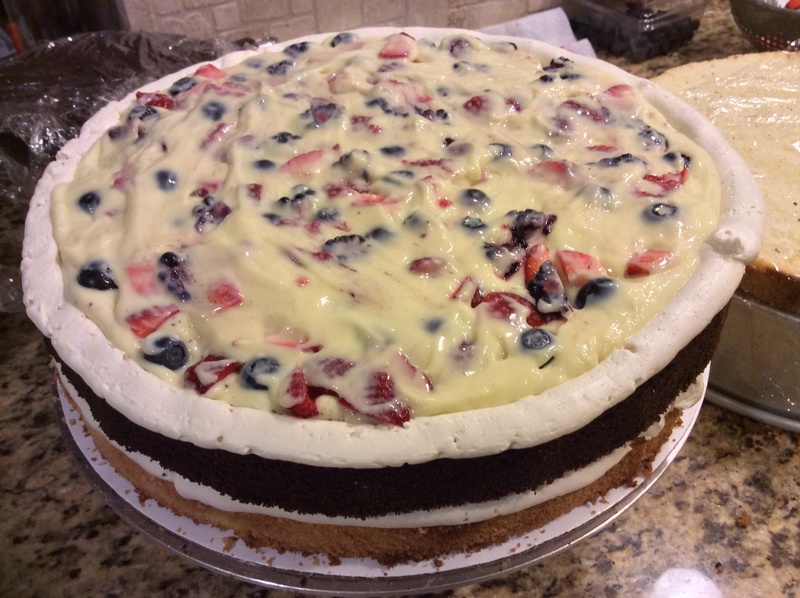 This cake, as requested, had many elements to it that came together wonderfully: vanilla and chocolate butter cakes with pastry cream and berries as filling. 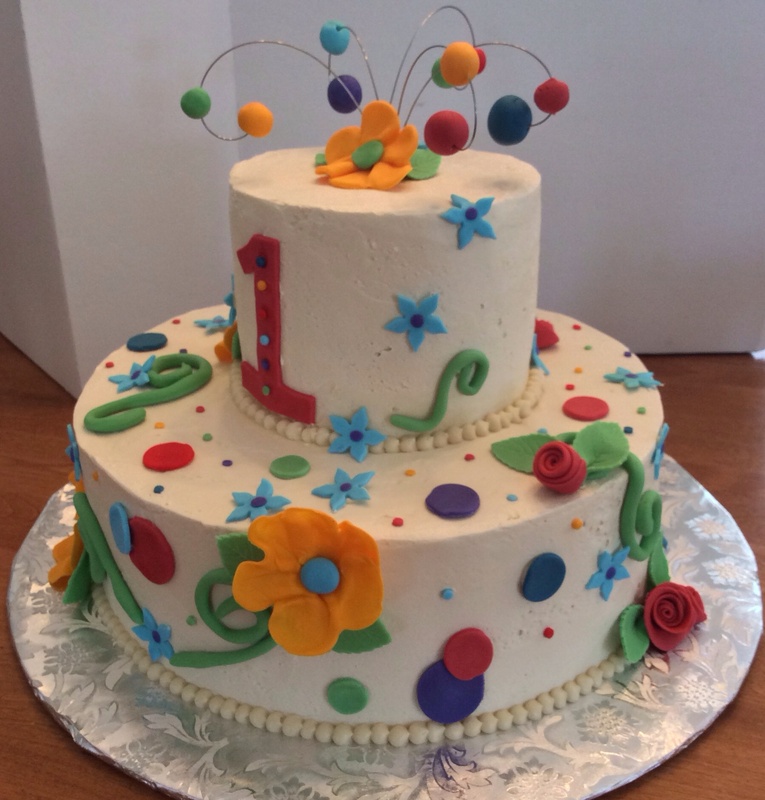 Homemade Italian meringue buttercream to cover the cake and fondant decorations to make it look like a party cake. Thanks for joining me on a picture walk of the last couple of weeks in my kitchen. 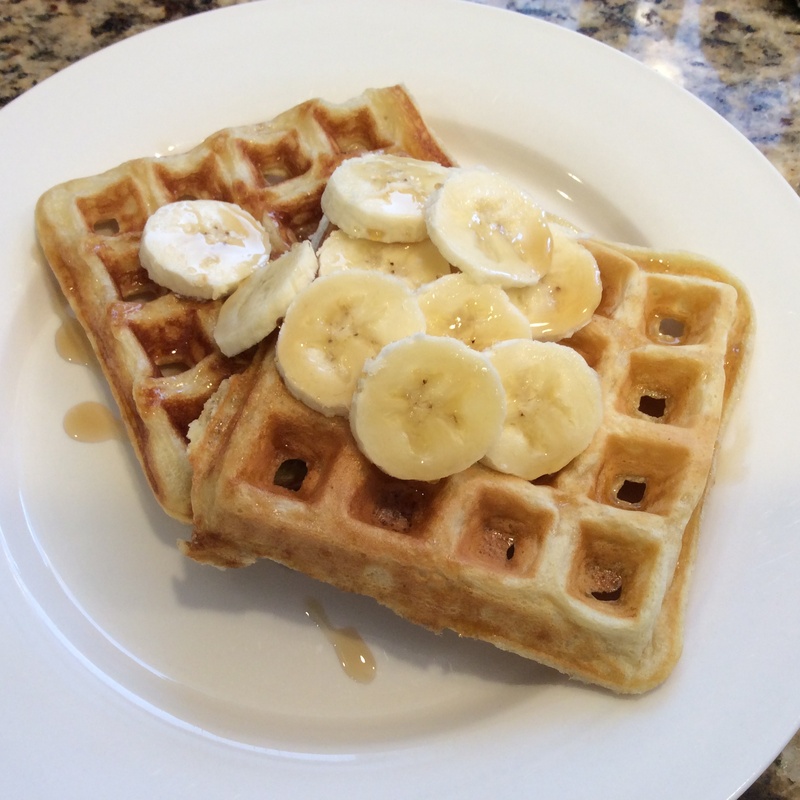 I have lots of recipes to blog about so stay-tuned for more. 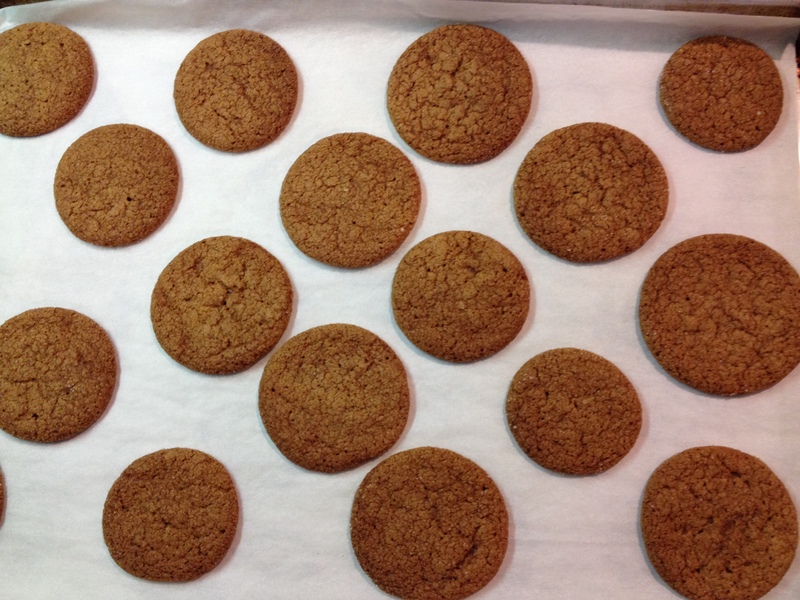 Gingersnaps are sweet and spicy with just enough warmth to make them a perfect winter cookie. I make these gingersnaps every year at the holidays. This year I noticed how popular they were both for the adult and the kid set. I made a mental note to make them again soon— because why wait another year for a yummy cookie! Last week I made them for Valentine’s Day and may have started a new tradition. I typically gravitate towards a chocolate dessert for this February holiday, but the kids already receive so many chocolate treats that I decided to pull out my gingersnap recipe. It was a big hit, again. We each enjoyed a couple for dessert (along with a few candies) and then we brought the remaining 50 or so cookies on a visit with cousins. They were gobbled up within a day. 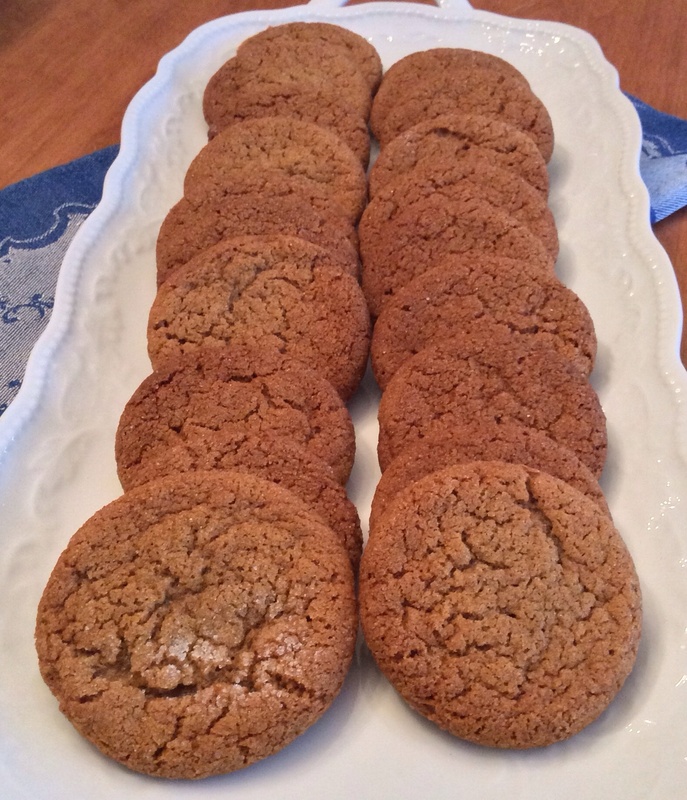 This recipe originated with my Aunt Trish who sent me a recipe for Ginger Sugar Cookies. 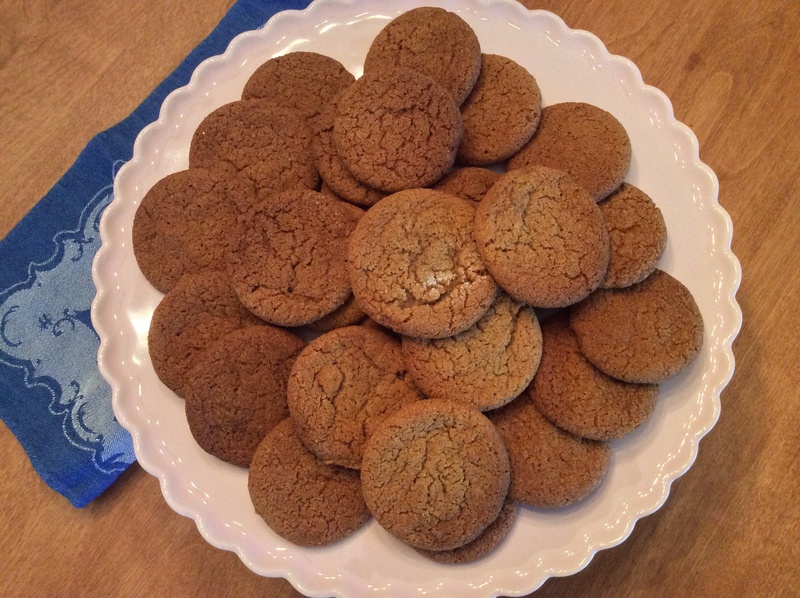 At the time, I was on a search for a good gingersnap recipe— one that was both crisp and chewy and had just the right hint of spices. I made a few adjustments to the recipe my aunt sent me and came up with the one below. I love the results and hope you do too. Try it. I bet those you feed will be glad you did. 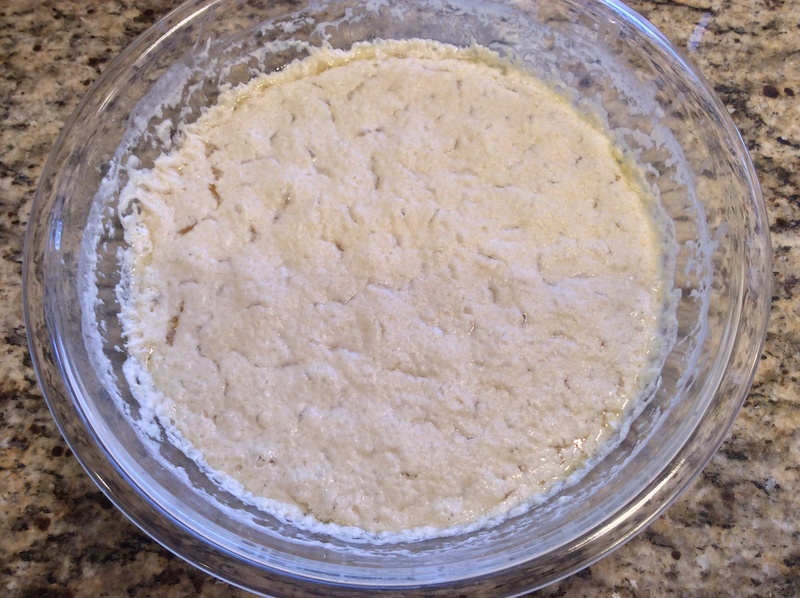 After chilling the dough, I use a teaspoon to measure out enough dough for a 1/2″ ball. Roll each ball of dough in granulated sugar. Flatten the dough ball with the bottom of a glass. 1. Melt margarine and butter. Let cool slightly. In bowl of an electric mixer, put the sugars and molasses. Add the melted margarine/butter and egg and beat until well combined. 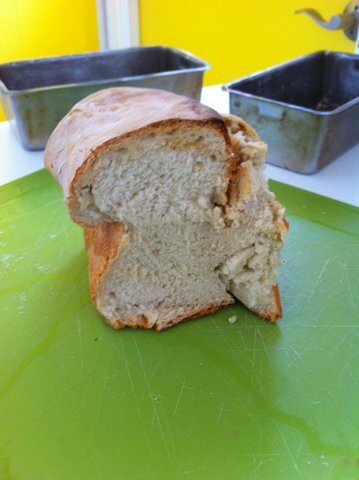 In a separate bowl, combine flour, baking soda, spices and salt. Whisk to combine. Add to butter mixture and beat until just combined. 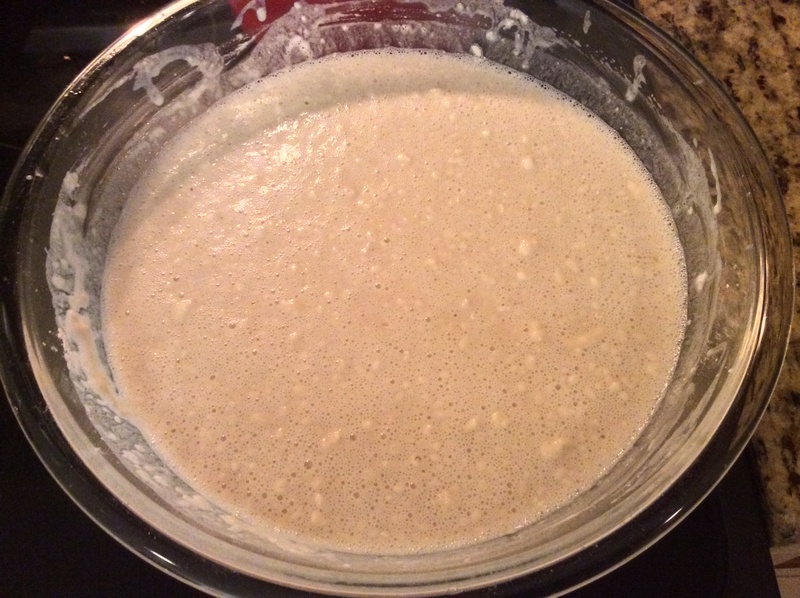 Chill dough for at least a couple of hours or overnight. 3. Preheat oven to 375°F. 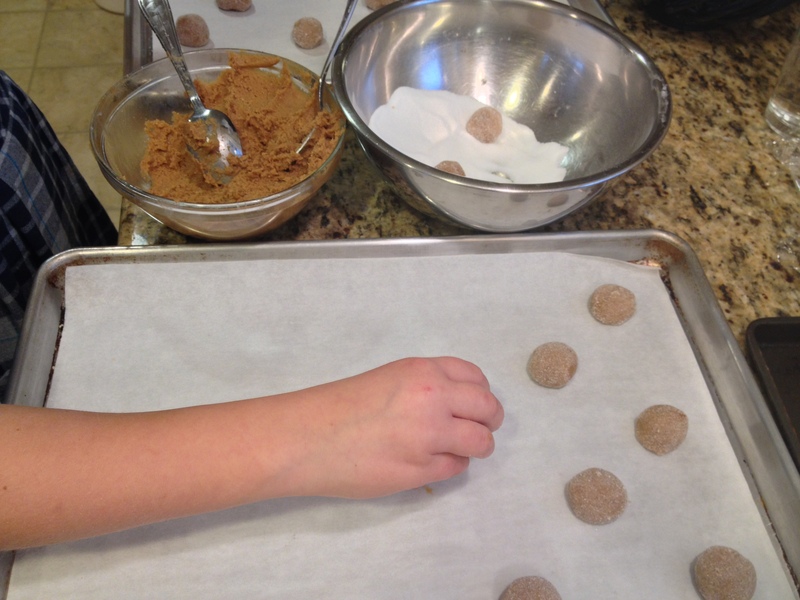 Roll dough into 1/2″ balls. 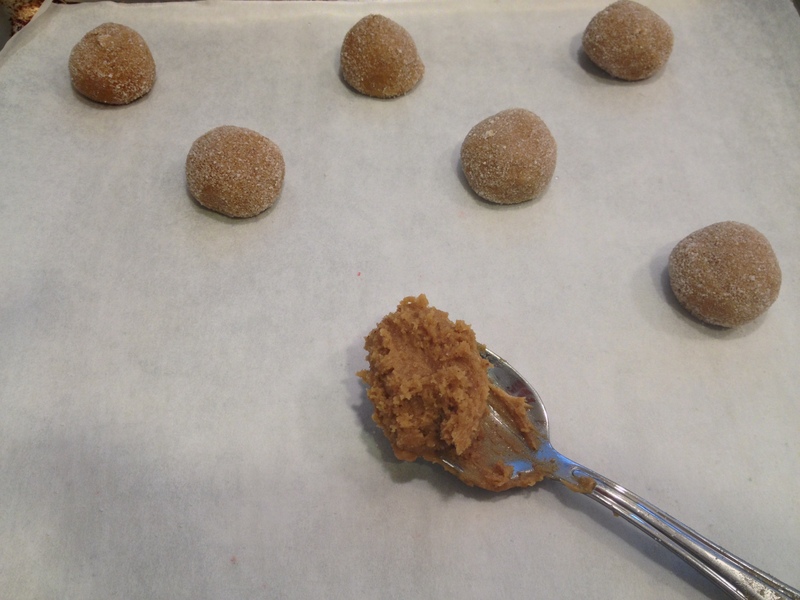 Roll each ball in granulated sugar and place about 2″ apart on a baking sheet lined with parchment paper (or greased). 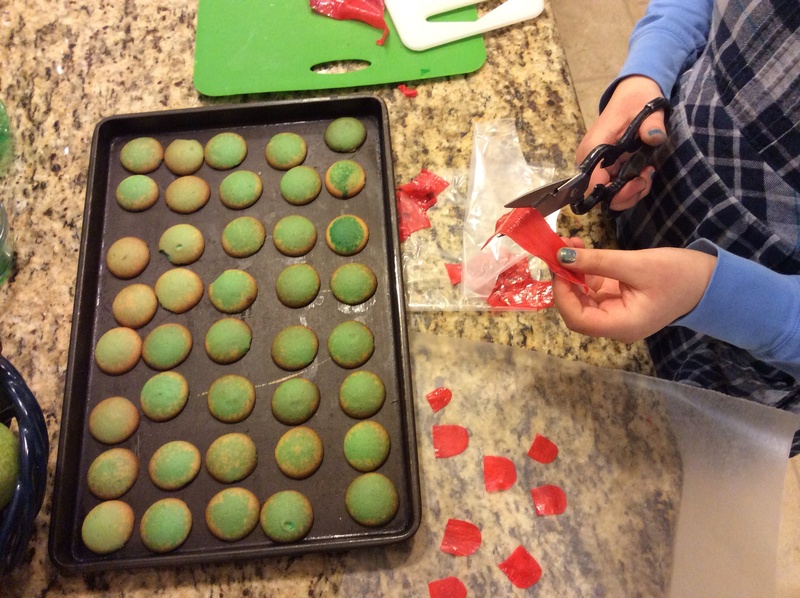 Using the bottom of a glass, flatten each ball of dough. 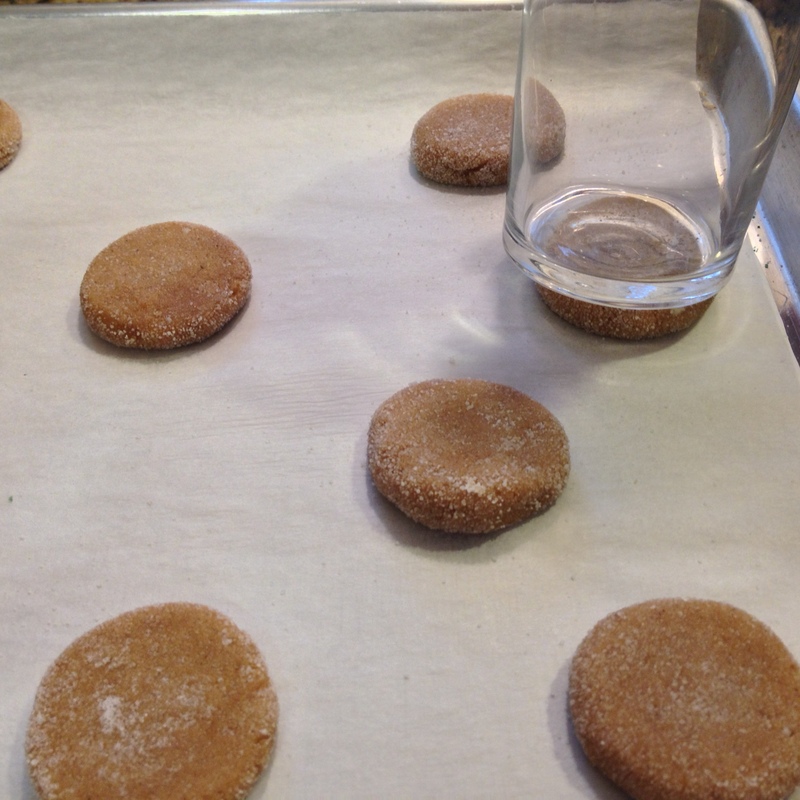 If dough sticks to glass, dip the glass in granulated sugar before pressing down on cookie. 4. Bake for 8-10 minutes, or until cookies are crackled looking and barely browned.